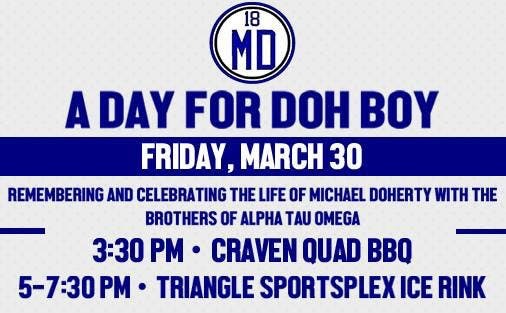 "Alpha Tau Omega fraternity will host an event March 30 to raise funds for a memorial bench in the Sarah P. Duke Gardens to honor junior Michael Doherty, who died in May. The fundraiser—titled “A Day for Doh Boy,” a play on Doherty's nickname—will take place on March 30, and will begin with a barbecue on Craven Quad catered by Alpaca Peruvian Charcoal Chicken. Later that Friday, the event will move to Triangle Sportsplex Ice Rink, where Doherty spent much of his time at Duke practicing with the Club Hockey team. “It’ll be really awesome to have the event at a place where he spent so much of his time and life,” said junior Kyle Baer, ATO president.